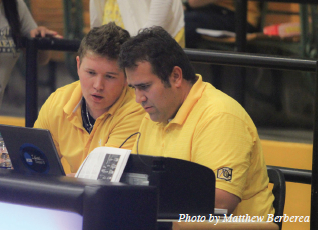 At the game: Student assistant Kenton Means and Sports Information Director Don Vieth watch overthe volleyball game that took place Sept. 18. While Cameron University underwent renovations around campus between semesters, the Athletics Department also saw some change over the summer. Don Vieth joined the Aggies June 15 as the new Sports Information Director. Vieth brings years of experience to the Aggies, having worked in the sports field at Winona State, his alma mater, as well as Division I High Point University. Originally from Mauston, Wisc., Vieth joined the Aggies from the Lone Star Conference office where he helped form the relationship between FoxSportsSouthwest.com and the LSC. This experience as well as his background in sports and multimedia is what Vieth said led him to CU. “I was actually at the Lone Star Conference office and did some work for them for the last six months,” Vieth said, “and I did a lot of multimedia work for the conference travelling from school to school. 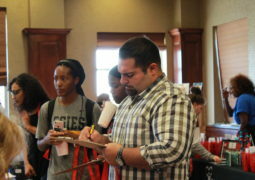 Vieth said that the relationships and excitement offered by a campus experience is what started his search for an opening at a university. Vieth had some time to get situated before games begin as CU did not have its first home game until Sept. 18. He said that he is looking forward to being courtside working the games and getting into the swing of the season. As a new SID Vieth said he will be looking to make some changes to help promote Cameron athletics. One area he said he looks to impact immediately is the social media presence of CU athletics. Beyond competition, Vieth recognized that Cameron has a widespread fan base with military families as well as international students. He said this is one of the reasons it is necessary to provide instant access to stats and video through social media outlets. Additional information on Don Vieth as well as Aggie Athletics can be found at www.cameronaggies. com or www.facebook.com/ cameronaggies.